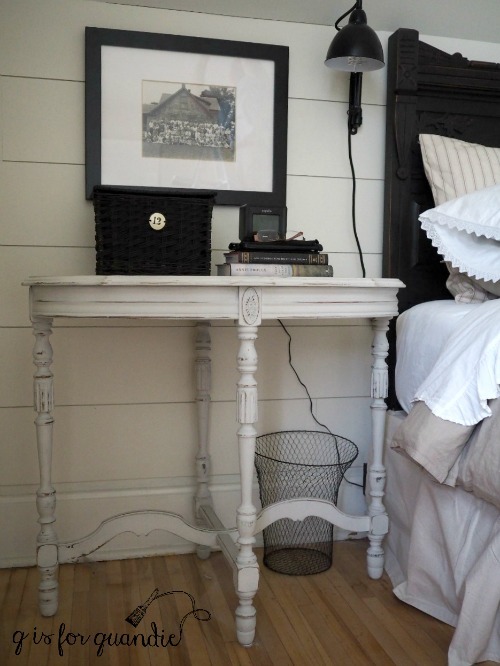 I shared my mismatched bedside tables with you in the post about Mission Possible. I was loosely planning to leave them ‘as is’ in the new version of the room, but as tends to be the case, the more silvery gray on the nightstands ending up being all wrong next to the Edgecomb Gray on the walls. So I sanded them just a little, cleaned them with some TSP Substitute and painted them both with two coats of Miss Mustard Seed milk paint in Grain Sack. 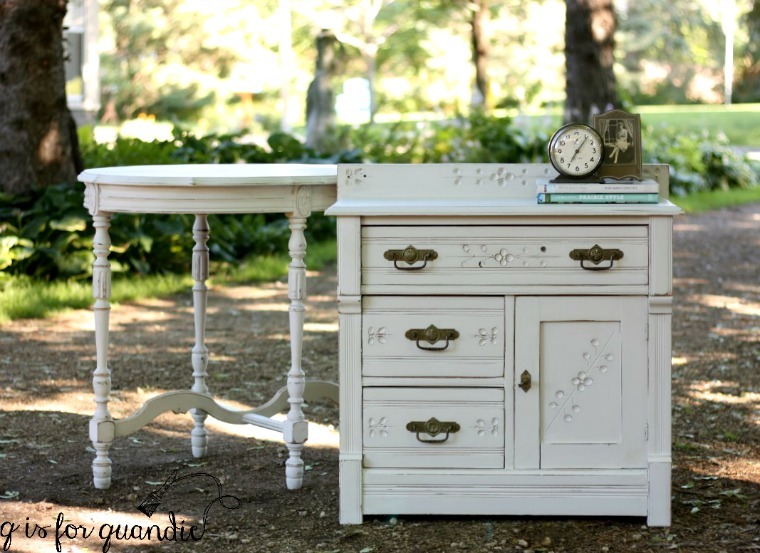 Painting previously painted pieces with milk paint can sometimes be a little bit of a gamble. Especially if you don’t know what kind of paint you are painting over. 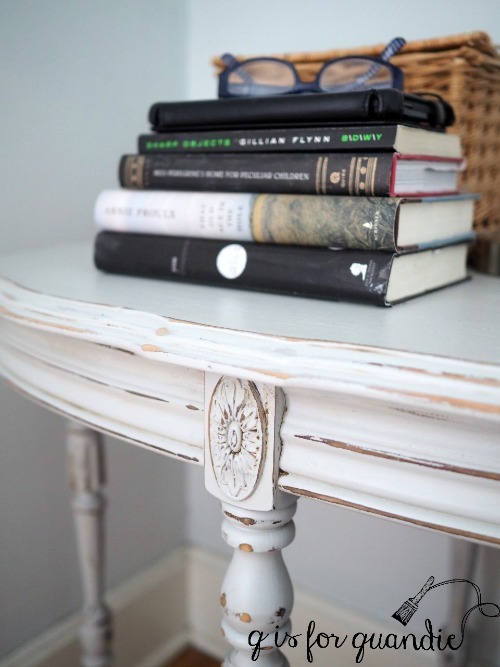 Paints with a satin or glossy finish will likely resist the milk paint giving you a chippy look which can be great if you don’t mind the original color showing through all of those chips. In this case I really didn’t want to see that color. However, I originally painted these two pieces with homemade chalk paint (latex paint mixed with plaster of paris and water). So I knew a little sanding and cleaning with TSP substitute would be all I needed to make sure my milk paint adhered fairly well. I always feel a little more comfortable experimenting with new products on pieces that I’m keeping rather than selling, so I decided to try using Low Sheen Finishing Cream from the Real Milk Paint Co. to top coat both of these pieces. I applied it using my Miss Mustard Seed wax brush. The Finishing Cream is really quite different from wax. First of all, it has a consistency sort of like a thick body cream. You brush it on, but you don’t work it in like wax. You also don’t need to buff it when you’re done applying it. It’s quite a bit less labor intensive than wax. It is a no-odor, zero VOC, water based gel top coat. Although I applied it outside this time, you know I love products that I can also use in the house during our cold Minnesota winters and this will be great for that. After 24 hours of drying time the finish is fully washable. 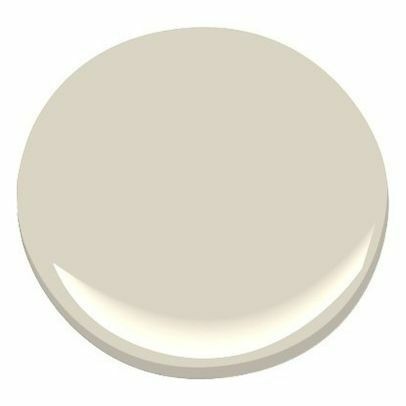 I read mixed messages online about whether or not this finish will change the color of milk paint, but in my experience it darkened up the color just ever so slightly. Not as much as a wax would, and definitely not as much as hemp oil would. It also adds just a little bit of a sheen. 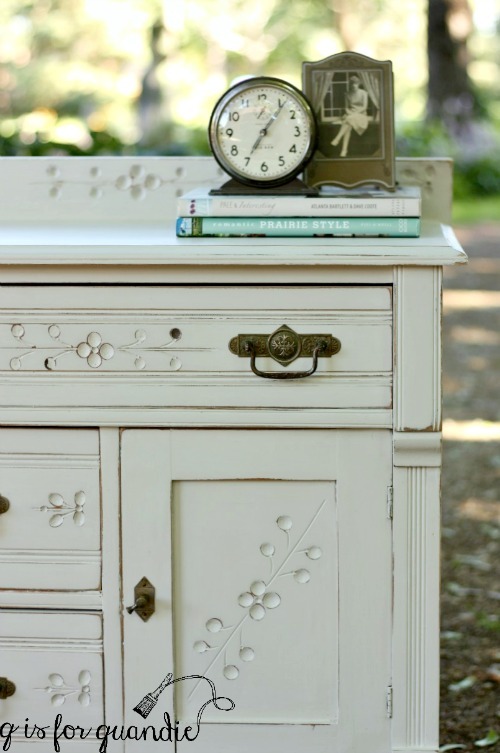 Personally I prefer the really flat finish of milk paint without a top coat, but I want to add protection to my pieces. 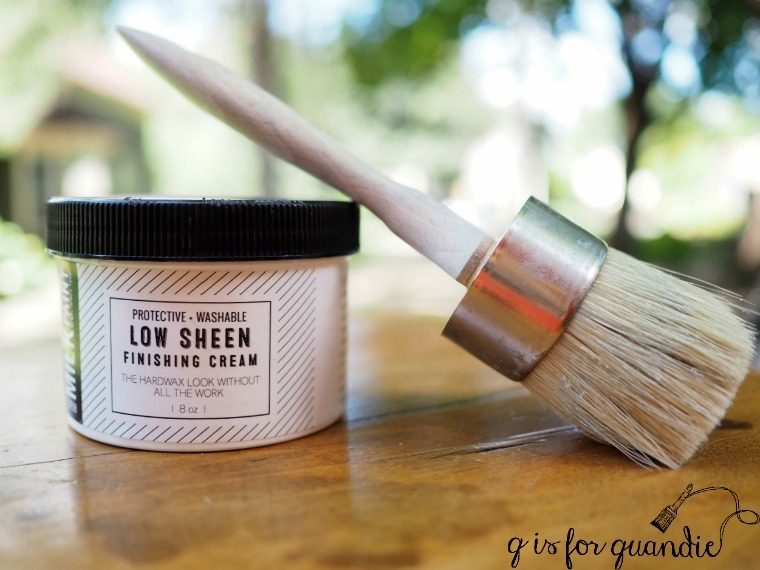 The Real Milk Paint Co also makes a version of their Finishing Cream called Dead Flat. I’m looking forward to trying that one next. My bedroom is really coming together now. Here’s my nightstand in place. Initially I’d thought I might re-hang the floral plates that were over the nightstands before, but I soon realized that they didn’t work with my new look at all. Instead I added some old black & white family photos in black frames. I also hung some reading lamps that I purchased from World Market on either side of the bed. 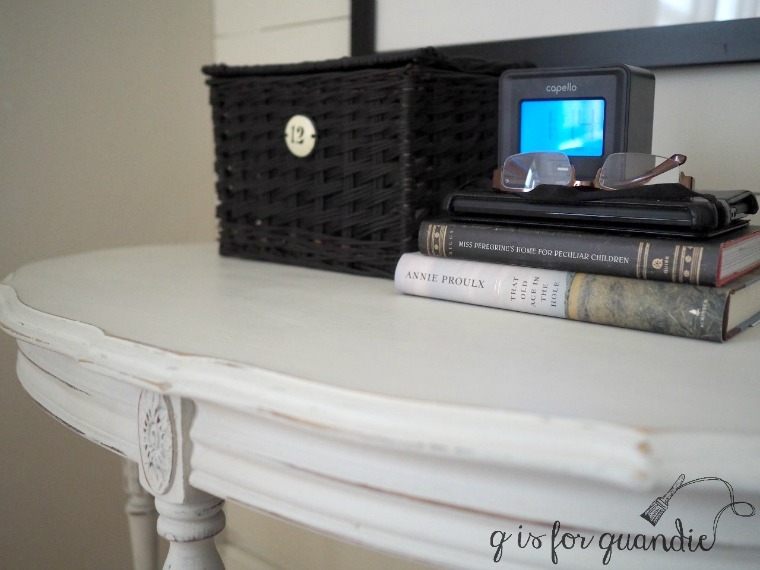 I spray painted the lidded wicker basket where I keep my important bedside items out of sight, like lotion, tissues and lip balm. I found the inexpensive alarm clock at Target. Here’s what it has going for it; dual alarms, lights up at night, doesn’t tick (it’s electric) much smaller than my old clock. Here’s what it’s missing; style of any kind. If any of you have a source for vintage looking alarm clocks with modern functionality (I must have dual alarms), I’d love to hear about it. I scoured the internet and came up empty. 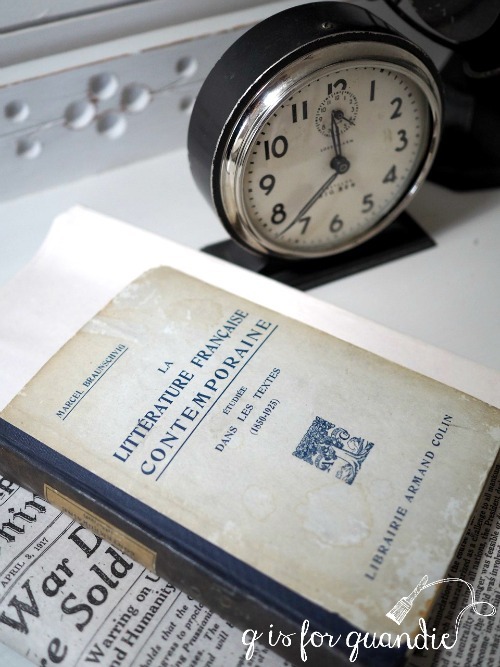 It’s totally ‘staged’ for this photo with a vintage alarm clock and fan (both non-functioning). These won’t actually stay on his nightstand, but it was fun to pretend just for these photos. The room is really coming together now. I’ll be sharing the story behind our new headboard on Friday, be sure to check back! Next the best day ever. The bed side tables look great. I have the same alarm clock problem. Why can’t someone make an alarm clock that functions and has some style too? I just bought a cheap ugly one at WalMart a week ago after giving up ever finding one that doesn’t look that a plastic black box. Also, does the finishing cream have to be reapplied in the future and I’m assuming it’s non-yellowing? Just curious. I’ve had trouble in the past with sealers turning yellow on painted surfaces. There has to be a huge market for a stylish alarm clock, right? As for the finishing cream, since this is the first time I’ve tried it I don’t really know from experience whether or not it will yellow over time, or whether or not I’ll feel the need to re-apply. The Real Milk Paint Co. website doesn’t mention yellowing, but it does say that you can re-apply if necessary. You are supposed to re-apply waxes and hemp oil about once a year or so, but I’ve rarely done so on any of my own pieces. I’ve only done it when I need to ‘fix’ a spot. 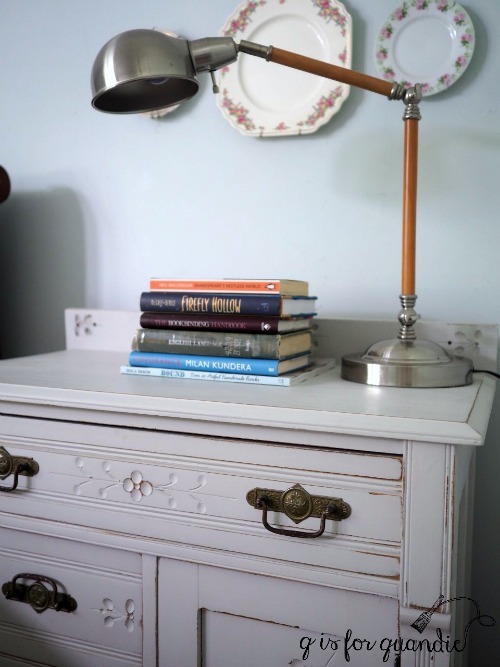 For example, I ‘fixed’ a water ring on a milk painted buffet by sanding it slightly and adding a new coat of hemp oil, which worked beautifully. I’ll have to keep you posted after I’ve lived with the nightstands for a while to see how the finishing cream performs over the long term. Thanks for all these tips! I’m always looking for new topcoat ideas for pieces I’m selling. Wax is supposed to be reapplied over time, hemp oil isn’t as durable (but I use it a lot). This cream might be the answer! Loving the new colors in your bedroom and can’t wait to see the headboard (you gave us a little peak)! I did give you a little sneak peek 😉 As for the finish, it sounds like we are on the same page Teri. I love wax and hemp oil for my own pieces, but for pieces I’m selling I’m thinking this finishing cream will be a bit more durable without sacrificing the look of a waxed piece. Dying to see the total reveal so I will return on Friday. The tables look great but the bed has me eager to see the rest. I think you’re going to like it Victoria! Yep, real life isn’t quite as pretty with cell phone chargers and practical alarm clocks! The tables look great! We have Edgecombe Gray in our house, too. I love it, but it can be changeable with lighting…sometimes more brown tones, sometimes more gray. It really does change quite a bit throughout the day! I wish it were just a tad more grey, but I’m finding that it’s working quite well with everything I’m adding in to the room so I’m just going to go with it. The whole finished room looks great. Got to see it this weekend. 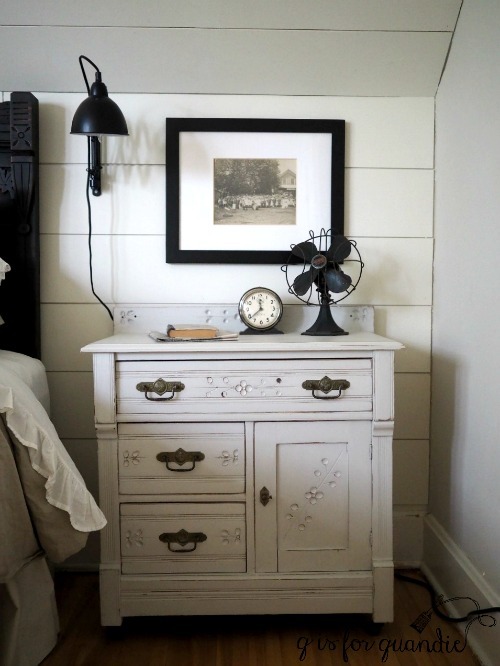 Too much white for me but it really looks good with the shiplap wall, the new headboard and the side tables. Love the family photos too. Thanks sis. Lucky I didn’t go with white walls and a white floor if you think this version is too much white!